The wash-out of the past few months was long forgotten today as I lounged in my garden on a true midsummer’s day. Doors and windows were thrown wide open to bring in the fresh summer air, washing was hung out to dry – which it did in no time in the heat of the sunshine flooding the garden – and elderflower cordial provided the refreshment. This afternoon Rob and I took a trip to our local farm shop for the week’s provisions. Our seasonal hull included pak choi, peas, blueberries and what is likely to be the last of the strawberries. 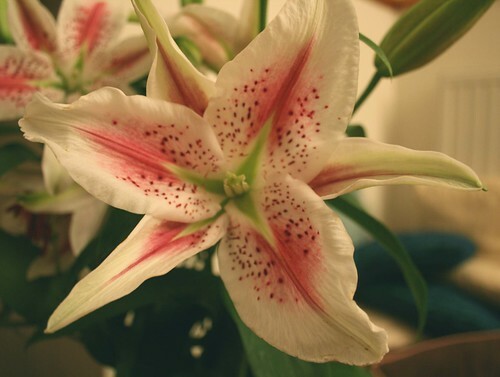 I also picked up a bunch of lily stems with a heady scent to adorn our living room. We’re very fortunate indeed, as our farm shop is blessed with the presence of a mobile butcher and fishmonger on a saturday. 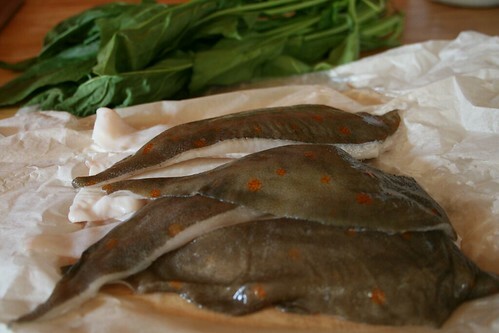 The butcher travels up from his farm in the heart of Kent and the fish monger from the coast. We bought a large free-range chicken for sunday lunch, some lean mince and half a dozen irresistible-sounding pork, apple and cider sausages. From the fishmonger we bought two beautiful plaice, clown-like with their bright spots, which were filleted for us and wrapped in paper, ready for dinner tonight. 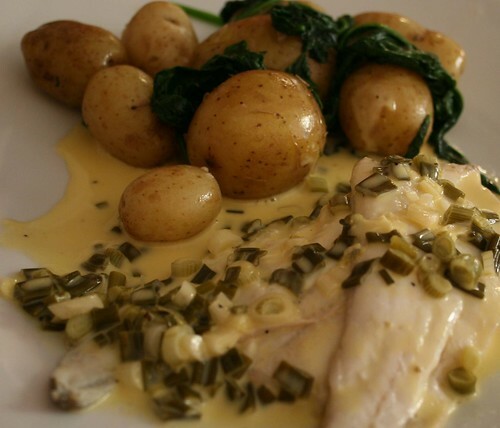 I teamed the fish with fresh spinach and new potatoes and a creamy white wine sauce with spring onions. It was quite delightful and the perfect end to a perfect summer’s day. Season the fillets with sea salt and freshly ground black pepper, then sauté them in a little olive oil until cooked through. In a separate pan make a sauce by sautéing 3 or 4 chopped spring onions in a knob of butter for a few minutes. Add the white wine and simmer until reduced by half. Next add the cream and simmer until the sauce thickens. Season and check the taste. Add more wine or cream as necessary and allow to thicken again, then serve spooned over the fish.